We need your help! 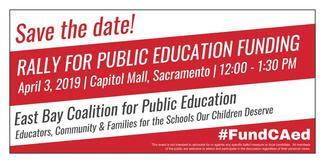 We need volunteers to sign-up for the following tasks associated with the April 3 rally in Sacramento being planned by members of the East Bay Coalition for Public Education. Please give us a bit of your time for this worthy cause! One per participating district would be great! Can students collect signatures? If so, I'll have about 10 with me.